Isn’t it amazing what God uses to speak truths to us. Last night I was watching the television show TIA AND TAMERA. This is a show about 35 year old twin sisters who are very close. They are both married and have children. When they were younger, they were just alike in their thinking, but as they have grown older, married, and each had a child, their thinking is not just alike on some issues. They have become their own person. The last exercise this specialist had them do involved teaching them how to really trust each other. Tamera got into a go-cart (pictured above) and donned a helmet that had a completely darkened front shield forcing her to drive blind. Inside the helmet was a speaker. Tia held a walky talky so that she could communicate with Tamera verbally guiding her as she drove around the track. Tamera was terrified to be sitting and driving in this dark, closed in place! She felt totally afraid, unsure, and even got disoriented at times not knowing for sure if the go-cart was really moving forward or was sitting still. As Tia began to soothe her and assure her that she was going to guide her around that oval track, Tamera began to calm down. She quieted herself and just listened to the serene, peaceful words of her sister telling her how fast to move forward, what direction to turn the wheel or when to go straight. In fact, she made it all the way around the track and crossed the finish line driving totally blind. When she lifted the completely darkened face shield of her helmet, her first words were, “What I learned from this is that it is easier to let go and trust.” As soon as she uttered those words, God said to me, “Candy, this is how you are to live your life as my daughter and now as a widow. I love you like no one else. Let go and just trust Me.” This is the hardest thing in the world for me to do because I fear that His way is going to hurt me even more than I have been hurt in the last 3 1/2 years. Yet, I know in my heart that this is something that I have to do in order to do what is right. How about you? Do you find that you, too, are having trust issues since the death of your husband? If so, what steps have you taken to rebuild that trust in God? The first thought I had when he made that statement was how widows find themselves feeling in this society today. As hard as we try, we don’t fit into any specific group. We aren’t a couple, we aren’t divorced, and many of us don’t think of ourselves as single. After all, this world is our home for now. BUT, when we get to heaven, we’ll be able to say just like that young Korean man did, “Here I fit in!” What joy that feeling will bring! Meanwhile as we adjust to the plan God has for our life, we keep going forward learning to fit into our new identity the best that we can as we find our place of service. “The vine needs to suffer. Going down into the earth, fighting to survive among the stones among the lime rock – this is what gives it it’s aroma. It’s taste. It’s unique character. These grapes will create a wine few other vineyards can compare with not because their life was easy, but because they had to struggle to survive. Two things stole my breath as Bardia taught me the riddle of the vine. First, that suffering improved the character of the vine’s fruit. Perfect ease and comfort would only ruin it. If my life were anything akin to the vine, then these calamities I bore need not ruin me. They could very well be my redemption. Second, come the right season, Bardia, the expert gardener, Bardia, the tender caretaker, Bardia, the one on whom these plants depended on to survive, slashed and hacked into the vine. He added to its suffering. He stripped it until, from my vantage point at least, there was hardly any life left. 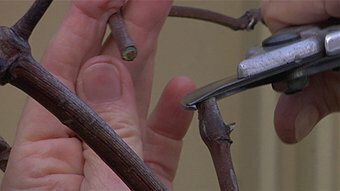 Yet the vine needed this implacable care. Bardia had claimed that he cut the vine in order to restore it; he took away from it to enrich it. I knew that he was selective in what he called the vine’s suffering. He would not allow pests to brutalize the plants, for example, or let weeds anywhere near them. He knew what to destroy, what to improve, and what to protect. If Israel was God’s vineyard, was I not one of His little vines? Was He the Bardia of my soul? Did He shield me from what would destroy me? Was He stripping me now on purpose only to give me a more abundant life? Would I one day bear fruit worthy of a king’s table? This was the life I wanted and God had taken it from me. I did not want more abundant fruit. I just wanted what I’d had before. Now I am not saying that God took my husband away from me to give me a more abundant life. After 3 years of trying to figure out why Bob died at age 58, I have concluded that before God created him, He knew the number of Bob’s days. The length of his life was foreordained and there was nothing that either of us could have done to change that. But, what I got from what Tessa wrote was that God has used Bob’s death to strip my vine down to the barest part slashing and hacking away all of the things in my life that needed to be cut away. He’s still in the stripping process and it is painful, but I look forward with hope to the restoration that He is doing in my life.